New Mexico lost to Boise State on Saturday in a seemingly meaningless matchup of unranked teams. But in a strange way, this game should be the face of the new college football, a sport where defence is non-existent and games are starting to look more like basketball shootouts. 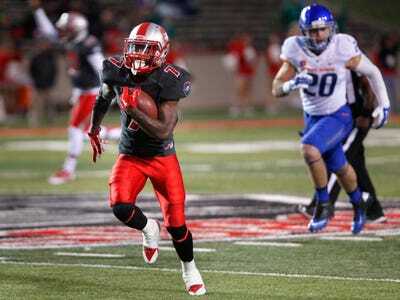 In this particular game, New Mexico rushed for a whopping 505 yards and scored 49 points. That is impressive. But it becomes head-scratching when you consider that New Mexico lost by 11 points! This game was an extreme, but New Mexico and Boise State were not alone. In all, 16 teams this weekend scored at least 45 points, seven scored at least 50, and three teams went over 60 points in their game. There were also five games with at least 80 points scored and eight teams scored at least 30 points and lost. Even Oklahoma, whose head coach Bob Stoops is considered one of the best defensive coaches in college football, gave up 48 points in their loss to Baylor. There are no more good defenses in college football, just offenses that screw up more often than others.